Cook the sliced apple in the butter and brown sugar in a pan over a high heat for 3–4 minutes, or until golden and caramelised. 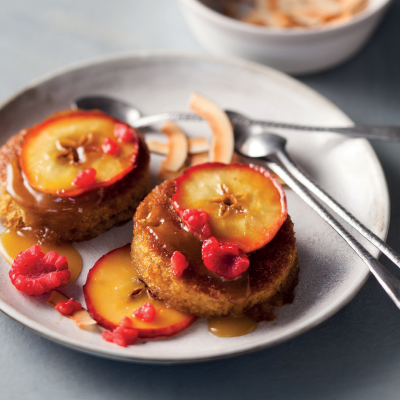 Heat the malva pudding according to package instructions, then cut into circles and serve topped with caramelised apple, toasted coconut and frozen raspberries. Do you want to make your own malva pudding from scratch? Follow one of these easy malva pudding recipes. Cook’s note: An alternative to the method below is to remove the pudding from the foil container (it’s easy when it has been frozen). Top it with fresh apple and pear chunks tossed in cinnamon, sugar, lemon zest and butter. Add broken crunchie biscuits and bake for 20–25 minutes.